Many states have special programs in place to help paramedics, police officers, EMTs, firefighters, and/or certified first responders find homes. Sadly, Georgia is not one of them. We understand that without this kind of help it can be difficult to find a mortgage – it takes a lot of time, which most first responders may not have, and a lot of money – ditto. 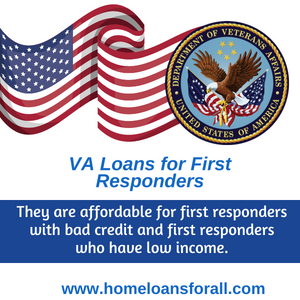 However, there are still great first responder home loans in Georgia if you know where to look. 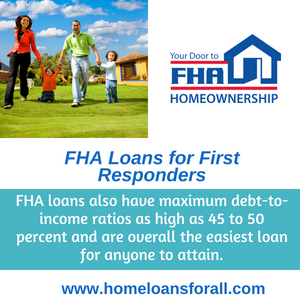 Get Help Pre Qualifying for a First Responder Home Loan In Georgia – Click Here! In this article, we’ll cover some of the federal and state level home loan programs that can help Georgia first responders find a home in a good area at an affordable price. We’ll also cover what to do if you have bad credit or low income. At Home Loans For All, we firmly believe that everyone deserves to live in a safe and permanent home and shouldn’t have to settle for an apartment or duplex, no matter what their financial situation may look like. Let’s dive in and start looking at some great Georgia first responder home loans! The basic home loan program offered in Georgia, as you may be already aware, is what’s called a conventional mortgage. Conventional mortgages aren’t bad, per se, but they’re definitely targeted towards the upper-middle-class. Some Georgia first responders may be able to afford these loans, but many will not. The basic terms of a conventional mortgage are a minimum credit score of 660 to 700, a debt-to-income ratio of 40 percent or less, upper-middle income, non-fixed interest rates, the regular payment of Private Mortgage Insurance (PMI), and an upfront down payment of 20 percent of the home’s total value. Even if you meet the credit and income requirements, that down payment is a real problem for many home buyers. Just because you can afford to make a few hundred dollars towards a weekly payment doesn’t mean that you can afford to pay thousands of dollars all at once, right? 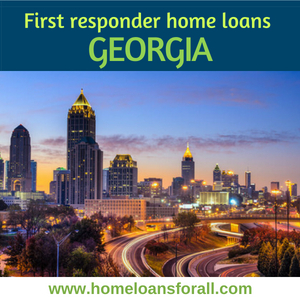 Here are three other first responder home loans in Georgia that you may find more accessible. VA home loans are insured by the Department of Veterans’ Affairs. As you can probably guess, this means that they are only available to former members of the armed services who have received a VA Certificate of Eligibility. However, since many Georgia first responders are ex-military, many of our readers may be able to take advantage of this extremely beneficial mortgage program. Because these loans are partially backed by the federal government, private lenders see them as having much less risk than a conventional mortgage. This means that they are willing to take on “riskier” prospects and may even give Georgia first responder home loans to applicants who would normally be rejected outright. Also, by not requiring a down payment (in most cases) or PMI (in all cases), these loans will save any loan buyer lucky enough to secure them thousands of dollars on the mortgage. The average terms of a VA home loan include no down payment, no private mortgage insurance, no minimum credit requirement (though lenders will often set their minimum credit requirements of 500-580), no minimum income provided you have a debt-to-income ratio of 50 percent or less, and fixed low-interest rates. FHA loans are becoming one of the most popular programs in Georgia, and when you look at the benefits of these mortgages, it’s not hard to see why. With low credit requirements and the fact that they’re offered anywhere in the state, they’re much more accessible than either the conventional mortgage or VA mortgage programs. Plus, while the individual monthly payments are sometimes slightly higher than they would be for a conventional loan (due to the PMI requirements), the initial cost of the down payment is much lower, and usually, you save money on an FHA loan over time. The average terms of an FHA first responder home loans in Georgia include a down payment of 3.5 to 10 percent (depending on credit), a minimum credit requirement of only 500, no minimum income provided you have a debt-to-income ratio of 50 percent or less, Private Mortgage Insurance payments for the duration of the loan, and fixed low-interest rates. Learn more here. 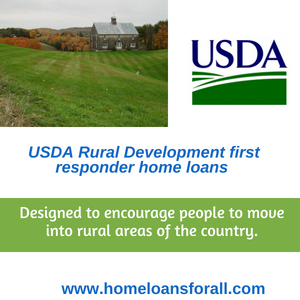 USDA Rural Development first responder home loans in Georgia are designed to encourage people to move into rural areas of the country. Approximately 97 percent of land in the state is eligible for this kind of mortgage, so consider applying even if you think you live in a suburb of a big city! USDA loans aren’t quite as accessible as FHA loans, but they can save you money in the long run. The average terms of a USDA loan in Georgia include low to no down payment, a minimum credit score of 600, less than 115 percent of the median income for the area, and conventional Private Mortgage Insurance payments. USDA loans usually also have some of the lowest interest rates around. Your credit score is seen as the ultimate measure of your financial responsibility. If you have bad credit, it suggests to mortgage brokers in Georgia that you might not pay back the money they lend you and makes it much more difficult to secure a good home loan. Of course, we know that sometimes bad credit happens to good people. So besides taking advantage of FHA and VA home loans, here are some other options to pursue in you’re looking for first responder home loans in Georgia and you have bad credit. The easiest way to get a home loan when you have bad credit is to seek the help of a co-signer. 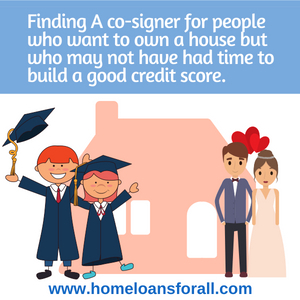 Finding a cosigner is an option that’s especially popular with first time home buyers, graduates, and newlyweds – people who want to own a house but who may not have had time to build a good credit score. A cosigner’s credit score will boost your own, allowing you to apply as though you have better credit than you actually do. This will lead to better terms, lower down payments, and a better chance of getting accepted. You can even find a cosigner for an FHA or VA loan to save even more money! However, the cosigner will be absorbing a lot of the risk by tying their credit directly to your property. In some cases, they may be approached to make payments if you miss a month. So make sure that your cosigner is someone you can trust and that they trust you in return before entering into this kind of agreement! Another thing to remember is that mortgage brokers can manually underwrite any of the requirements on a home loan. So they can lower the credit requirements or get rid of the down payment entirely. They usually only do this in special cases, and often require proof that your current financial situation is not your fault, but they may be willing to give special consideration to Georgia first responders. Speak with your lender today and see what they can do for you! Many buyers find that the hardest part of buying a house is affording the steep down payment. This is especially true when you’re trying to find first responder home loans in Georgia with bad credit. A bad credit home buyer is seen as a higher risk, so even if it’s an FHA loan, lenders will usually expect you to make a higher down payment so that they know that they will make at least some of their money back up front. This is when you might start needing to look at the down payment assistance programs offered by the state. If you apply for a Georgia Dream Home Loan through the Georgia Department of Community Affairs (GADCA), the state will pay up to $7,500 of the down payment for you as long as you still pay at least $1,000 yourself. 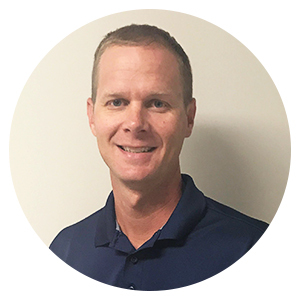 We hope that this article has helped you better understand how and where to find first responder home loans in Georgia. At Home Loans For All, we believe that everyone deserves to live in a safe, comfortable, and permanent place of their own no matter what their finances look like. And until the state of Georgia gives first responders the respect and assistance they deserve, we’ll do everything we can to help you find Georgia mortgages for first responders!